On Sunday 3 July 2011 the Research Committee of the IUCN Academy of Environmental Law, the IUCN Environmental Law Centre, Bonn and the IUCN Commission on Environmental Law organised a pre-conference workshop entitled "Towards the legal recognition and governance of ecosystem services" at Mpekweni, Eastern Cape, South Africa. At this workshop, papers were delivered on various aspects of ecosystem services. These included an introduction to ecosystem services from a legal perspective by Alejandro Iza of the IUCN Environmental Law Centre, and an introduction from a scientific perspective, by Christo Marais of the South African Department of Water Affairs. Justice Antonio Benjamin from the High Court of Brazil gave a presentation on Jurisprudential experiences in Brasilia and the importance of the legal recognition of ecosystem services; Alistair Rieu Clarke(University of Dundee) spoke on "The 1997 UN Watercourses Convention and Ecosystem Services: Can a Combined Reading Ensure that International Watercourses are Utilised in an Equitable and Reasonable Manner? 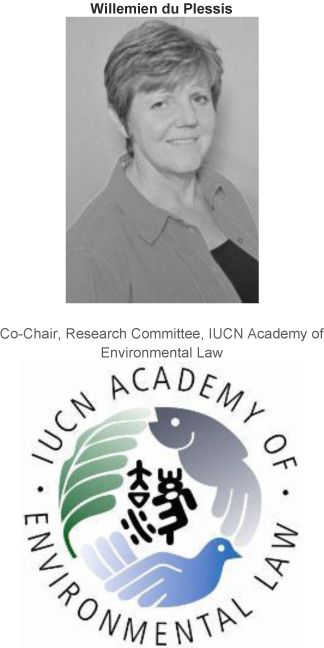 "; Jamie Benidickson (University of Ottawa) presented the new IUCN "Guidelines for Protected Areas Legislation" and David Hodas (Widener University) gave a presentation entitled "Seeing into Law's Blindspot: Ecosystem Energy Services". The discussions during the workshop enabled participants to realise that there were numerous angles to the topic of ecosystem services and that the discussion had not been fully explored, in particular concerning the human livelihoods aspect and the intricate relationship between ecosystem services and rights. It was therefore decided that there would be an open call for papers for publication on these issues, which would contribute to furthering this important discussion in the light of the major world conferences that would have taken place from 2012 onwards. Ecosystems are vital for human well-being as they provide valuable goods and highly important services. While ecosystem goods such as food or water are palpable and their value for human well-being is well known, ecosystem services (e.g. water purification, preventing soil erosion, etc) are less obvious and humans are often not aware of them at all. There is, however, a strong relationship between human well-being and ecosystems services, since healthy ecosystems and the continuing provision of ecosystem services can be perceived as key for realising internationally and domestically guaranteed rights, for the fulfilment of the Millennium Development Goals, and as part of any poverty alleviation strategy. In turn, failure to respect, ensure, and fulfil internationally and domestically guaranteed rights can be a trigger for environmental destruction and a threat to the continuous provision of ecosystem services, since people might be forced into unsustainable practices for lack of better options. Indeed, despite their importance for human well-being, ecosystem services are more and more under pressure and increasingly threatened by human activities. Growing populations and rising standards of living, pollution and natural disasters have led to the overexploitation or destruction of such services. Therefore ways have to be sought to address this problem in a comprehensive manner, with effective governance including strong accountability mechanisms being a central component. Alberts and Jurie Moolman explore in a note how ecosystems can be protected by way of biological control and the legal framework that currently exists in South Africa to enable such protection.